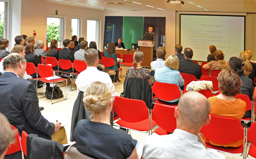 Approximately 120 participants from both the public and private sectors in the EEA met at the EFTA Secretariat in Brussels on 13-14 September 2012 for the biannual seminar on the EEA. During the first day, representatives from the EFTA Secretariat, the EFTA Court, the EFTA Surveillance Authority, the EFTA Statistical Office and the Financial Mechanism Office gave presentations on the day-to-day operation and management of the EEA Agreement. ‘The evolution of the Single Market and the EEA Agreement – 20 years on’ was the focus on the second day. In the first presentation, Jacques Pelkmans of the Centre for European Studies (CEPS) provided an analysis of the design and purpose of the Single Market, and how it has developed through the last twenty years. Christian Frommelt of the Liechtenstein Institute gave a presentation on differentiated integration in Europe, and presented five conclusions from his research on possible lessons to be drawn from the EEA Agreement. The final speaker of the day, Georg E. Riekeles from the Cabinet of Internal Market Commissioner Barnier focused on the way forward for the Single Market, including an overview of the upcoming proposal for a Single Market Act II. EFTA would like to thank all the speakers and participants for making the seminar a success.